Kingdom Books is honored to host Martín Espada on Sunday October 8, reading from his new collection, THE REPUBLIC OF POETRY. I thought I'd be ready to talk about it last week, but I'm still mulling it over. The collection is both tight and intense. Its three sections take vastly different directions: The first, "The Republic of Poetry," addresses both Neruda and Chile, including Pinochet. The second, "The Poet's Coat," is elegiac. The third, "The Weather-Beaten Face," includes several anti-war poems and others that seem at first reading to be deeply personal. All of the poems fit within the swathe that Espada's previous collections have swept: poetry as political artistry, poetry as resistance, poetry voicing the terrible wrongs of the world and demanding their redress. The fact that the "disappeared" cannot be returned to bodily life is only one more reason that their life as spirit, vigor, and beloved friends and family must find restoration. Because THE REPUBLIC OF POETRY is so particularly tightly composed, I'm going to wait a bit longer before tackling a full review of it. Meanwhile I've read other work of Espada's -- TRUMPETS FROM THE ISLAND OF THEIR EVICTION, A MAYAN ASTRONOMER IN HELL'S KITCHEN, and the stirring foreword to POETRY LIKE BREAD. The name Espada means sword or machete to this poet; expect more metaphors of the blade to follow. It is not necessary to be Puerto Rican or Nuyorican to forge a poetry of resistance; African Americans and every woman can speak to the same. But to speak to the Latino resistance, from New York (or even Amherst, Mass. ), to Puerto Rico, to Cuba, to Chile, to Nicaragua, even to Spain -- for this, Espada is powerfully called. One last note: The reading we're sponsoring will be held at 3 p.m. at the St. Johnsbury Athenaeum, to have enough space for many listeners, but we'll host a small lunch here at Kingdom Books ahead of time. When I asked Martín Espada whether there were any particular guests he might like invited to the lunch, he listed Galway Kinnell, Grace Paley, Julia Alvarez -- then said, "I'd like to meet (Congressman) Bernie Sanders." So we've invited Vermont's independent voice calling out for restoration in the halls of Washington, DC. I hope the Congressman will accept. I look forward to witnessing this connection and its fruits. Summer is waning. The nights are crisp, and "the colder hollows" are threatened with frost. Other signs of autumn: the list of new mysteries for the season, and the endless political ads on television and, increasingly, online. Two steady Vermont authors are bringing out next volumes in their series. Neither is likely to change anyone's world or even worldview, and they are ardently not political. But for each, there's a connection. The first is STILL AS DEATH, third in the Sweeney St. Goerge series written by Sarah Stewart Taylor. In this artfully plotted murder mystery, Sweeney's curiosity about a missing Egyptian necklace -- part of the "funerary arts" that this detective-in-spite-of-herself specializes in -- ends up provoking violence. With a number of odd circumstances presented quickly in the prologue and first chapter, Taylor sweeps smoothly into a tight and fast-paced work that markes very clearly her movement out of "new writer" status and into the professional league. Watch for a full-length review in the Vermont Review of Books, as well as on our web site, www.KingdomBks.com later this week. The book release date is September 5. We'll host a reading and signing event for this Vermont-authored mystery (set in Boston this time) on Monday September 18, at 4 p.m. Pick up the newest book, and fill in with the earlier ones too, if you're missing one. Sarah Stewart Taylor pulled this book together while also becoming a mom and supporting her husband, state senator Matt Dunne, as he launched his campaign for lieutenant governor. Matt's a clear-voiced, capable young man, who already had a turn running Americorps for a year and a half from its Washington, DC, office, and who takes strong stands on human issues like health care. So in order to give him a chance to meet some local citizens, whether mystery fans or not, we'll follow his wife's event with a 6 p.m. dinner (no charge); let us know in advance that you'll attend so we can plan the meal, and come get acquainted with the candidate and offer him your best advice. Vermont's a small world. It's this easy to make a difference. Attend one or both events, but please do let us know you're coming. It's a bit early to talk about the plot just yet, as this one doesn't release until October. But Dave and I received a manuscript copy from the kind publisher, and we're excited. Gunther comes through strong, direct, and determined, and his sidekicks Willy Kunkle and Sammy Martens, our favorites, have great roles. Good suspense, good wrestling, and a satisfying ending make this a terrific addition to the series. Mayor's not an overtly political character himself (isn't even married to one as far as we know), but in two ways he dips a toe into the stream. The first is Joe Gunther's continued dilemma of having his long-time lover Gail more interested in state politics than in his world of Brattleboro and crime patrol. The other is Mayor's own life, quietly positioned as a constable, "first responder" (rescue squad member), and on-the-spot medical examiner for deaths in southeastern Vermont. He's chosen to be positively involved in community life, not a common choice for an active author in many of the stereotypes. When we host an event for him on Monday November 13, we won't be surprised if he's wearing half a dozen pagers that keep him in touch with the responsibilities he chooses. Moreover, his plots -- which grapple with the changes in Vermont, from land development to downtown yuppification to taxes to drugs -- offer an insider's view of what we all hope to protect and nurture in our hometowns. Part of the emotional value of reading a Joe Gunther book is, Joe sees what's going on. And cares about it. So in this season when the role of Americans in the world is so much on our minds and affecting our political choices, both Mayor and Taylor, each in a different way, remind us that the choices are real. A vote has rarely been as significant as in the past few years. Every voice makes a difference, especially in Vermont. Tomorrow: Another form of commitment to change, as poet Martín Espada comes north. Last night on public television I watched a program about Hollywood's blacklist era -- or so Dave described it when he clicked onto it, as I continued to gently edit some pages. Soon I was caught up into the unfolding saga of two friends: director Elia Kazan, and playwright Arthur Miller. How each responded to the political and employment pressures on them during the anti-Communist "witch hunt" of the House UnAmerican Activities Committee (HUAC) attack on Hollywood formed the underlying threads of the narrative. Each took actions based on principle, but with far different results. Most striking to me last night was the discovery that Miller's play "The Crucible," which I read in high school as part of the English/US History curriculum focused on the America of 1500 to 1900, carried immense significance as commentary about the McCarthy/HUAC years and the choices of Miller and his once dear friend Kazan. How could the splendid teachers in my life have avoided pointing this out? But they did. And how could I, even watching the recent film release of "The Crucible," have remained ignorant of its political application to the 1950s and to today? God knows. But I did. Thank heavens for more information, more passion, more perspective. Awakening people to political implications, to value choices, and to their own strength as voices and hearts outspoken has been a long-term role of small presses and the writers who seek them. Thomas Paine presented perhaps the most famous American small-press pamphlets, beginning with his 1776 publication of "Common Sense," calling his compatriots into the War of Independence. His others are at least as powerful and respond to the horrors of the French Revolution, the misuse of religion, and the enduring distorting power of the monarchy. In this light, I welcome the word of poets and printers Greg Joly and Bob Arnold, Vermonters. Greg Joly offers his work and the work of others through Bull Thistle Press (founded in 1990 in Jamaica, Vermont). 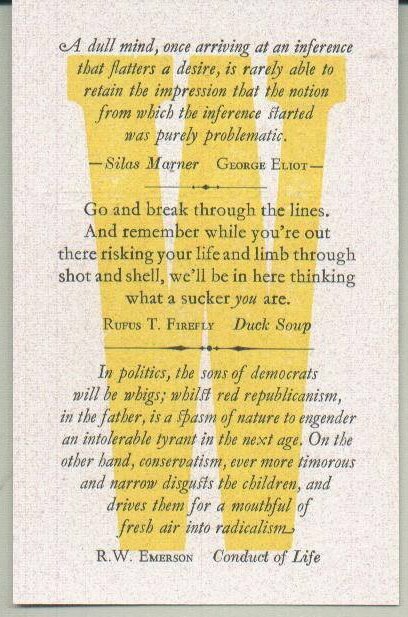 His recent postcard-size broadside "W" offers significant statements of the past as a gentle but direct critique of today's war-loving Presidency. An earlier one, from 1998, quotes back-to-the-land "heroes" Helen and Scott Nearing, standing up for presentation and discussion of "public questions" as "a right, a privilege, and a duty." Bob Arnold's Longhouse Press emerged in Green River, Vermont (near Brattleboro), in 1971. At first, Bob published through mimeo and photocopy, following the example of other political and poetry-driven presses of the 1950s and 1960s. One of my favorite pieces from this time is "Potterwoman" by Vermont poet Barbara Moraff, whose wrestling matches with motherhood, sustainable living, and the twin arts of pottery and poetry become a feminist manifesto of love and strenghth. Bob's own poetry also emerged through Longhouse, but also through other presses, like Pentagram and Barry Sternlieb's Mad River Press. Later, influenced by friendships with Joly and Ed Rayer (Swamp Press), Bob incorporated letterpress work in the covers of his productions. Now the two printer/poets also collaborate in street poetry, speaking up for the America of Thomas Paine. Taking to the streets of Brattleboro at first to raise support for the victims of Hurrican Katrina, they now also host "discussion of public questions" such as the continued occupation of Iraq, and the threat of further global armed confrontations as the United States leadership braids together oil, responses to terrorist threats, and a sense of moral outrage. I quote here from Bob's ever-informative web page, where he provides long "letters" about poetry, music, and love of country: "In an act of good citizenship and being with the ones you love, Bob Arnold & Greg Joly will join with others at the Brattleboro Commons on Sunday July 30th to greet peace activists Frances Crowe and Cindy Sheehan visiting town to set their shoulders to the wheel to continue Impeachment proceedings (remember: we the people?) on the current President of the United States, a war criminal. We plan to contribute with our year long readings for New Orleans /Katrina by drawing a circle 10 feet around and just begin reading poems. Quietly. Probably under some maple tree. For Vermont, Love & Protest." Bob's web site is www.LonghousePoetry.com -- Greg, who lives "off the grid" with his wife Mary, isn't online, but Kingdom Books will forward messages to him at Bull Thistle Press if need be. I'll wrap up here with a simple observation of my own: For both poetry and the political responsibility of thought and speech, small presses contribute a glorious independence. When, in addition, those presses add the slow and lovely work of fine design to their printings, they help to ensure that the work will be held, read, kept, and pondered. Recently there have been several good articles on whether thrillers qualify as mysteries -- and, not unexpectedly, they tend to answer "yes -- but." This is followed by a claim that the thriller merits its own genre label, and its own attention. For me, the satisfaction of a good mystery lies in two accomplishments of the author: that clues or puzzle pieces are laid out in such a way that if I work really hard (or loosen the bonds of reason to explore imagination at its edges), I can ferret out the solution at least a page or two before the equally dedicated sleuth figure does so; and second, that the character who has most seized my attention has, to some degree, control of life's choices. I've just finished reading Pat Barker's 2003 novel DOUBLE VISION. Entirely separate from her noted Regeneration trilogy, it probes with firm strong fingers at the bruises of violence and war in our lives. If I see it as a mystery -- which the presence of deliberately laid trails of clues, suspense, and characters capable and willing to fight against the dark can readily justify -- then I accept the breath-taking absorption of my last few hours of reading as entirely merited. Moreover, Barker's nearly domestic setting parallels my own: listening to "war and rumors of war," seeing photos of bombed and homeless mothers and children in "living color" on the front pages of the New York Times, knowing the cards dealt have awarded me an almost obscenely peaceful life compared to what is happening an airplane's flight away. "Clean water for tea" is the last line of a poem I wrote a few weeks ago, calling it "Prayer from Peace" and hoping that one reader in five might notice the "from" rather than "for." I don't expect to leave the fragile safety of Vermont to take arms against a sea of troubles. So somehow, I need to take what stands I can, here and now. 1. Politics and small presses: Greg Joly, Bob Arnold. 2. Politics and poetry: Martín Espada, Galway Kinnell. 3. Politics and mystery: Sarah Stewart Taylor and Matt Dunne, and Archer Mayor. In each of these, there's an invitation to thought, and a possibility of action. Autumn events on the calendar for Kingdom Books promise startling opportunities. I hope you'll share a comment as the coming entries unfold. When John Barth gives the cover blurb to a novel, I sit up and pay attention -- even though it's not in my usual leisure field of mysteries. So I took up the two novels by Katherine Towler, SNOW ISLAND and EVENING FERRY, to discover what this view of New England looked like. Towler set out to capture life on an island off the coast of Rhode Island, through a century of wars and recovery, and through the lives of the people in the timeless landscape governed by time, tide, and weather. Her first attempt was through linked short stories, and she got stuck, stalled. When she took her 20 years of writing experience and applied the skills and passion instead to a set of three linked novels (the third one is in progress), the form worked much better. Reader beware: The novels are not true sequels. Yet their relationship, like the characters in them, enfolds secrets and discovery in an insistent dance. Determined to portray the effects of war, Towler took SNOW ISLAND into the buildup to World War II; explored the nature of the home front during the Vietnam War in EVENING FERRY; and says her third novel, set in the 1990s, also involves war (I presume in the Persian Gulf). She's a compelling speaker. She said this evening of the first book, "If I'd been in my right mind, I never would have started to write a story that takes place before my own birth, but not so far in the past that other people couldn't correct me!" Most often she gets corrected on relatively small points of history; she did years of research for the books, including living for a while on Prudence Island (fictionalized in the books but recognizable geographically), and learning enough about a Model T Ford to be able to guide her character through driving one. But she pushes against the term "historical novel," saying that she wanted the characters, rather than the research, to lead her in writing. She notes, "The art, I think,is in making the book historically accurate without letting the research show." I enjoyed this diversion out of the usual Kingdom Books waters. Moreover, I suspect I'll be thinking about Towler's points as I return to, say, the mysteries of Charles Todd. Plot, character, plot, character, plot, character. Need I say more? One reason Dave and I took "fine press" as the third specialty of Kingdom Books (our other two are poetry and mystery) is that good poetry has always linked closely with fine press work. Sometimes it's the shared sense of beauty; sometimes it's the shared passion for words; and often, perhaps especially here in New England, it's the independence of thought. Broadsides, for instance, come up in American independence politically long before they hold poetic significance in our history. I've been researching the history of New England fine presses and noting how the people involved have influenced each other. Cross-mentoring may be a new term, but it's an old habit. From practicing on each other's hand presses to feeding each other type to sharing poetry, the connections form a thick and necessary web. So I found great delight yesterday in finding an extra set of strong strands that link today's Vermont fine presses with the Midwest: Michael Tarachow and his Pentagram Press affected the thinking of two Vermonters that I've spoken with lately, Bob Arnold (Longhouse Press) and Jim Schley (Chapiteau). And some of Tarachow's significant first poets were from New England: Bob Arnold (as poet), and Down East poet Ted Enslin. I'm also noting the variety of presses that picked up work by Hayden Carruth. Arnold's press is strongly connected here, as Bob and Hayden became close friends. To write or speak the truth (which, in my opinion, is one excellent strength of poetry) aligns so nicely with those who will shape it powerfully on the page. Rachel Hadas: The Poem as the "Well-Wrought Urn"
A quick meeting with poet and classics scholar/translator Rachel Hadas today reminded me of some ground she covered earlier this summer with teacher-attendees at the Advanced Placement Institute in St. Johnsbury, Vermont. Hadas, who considers herself a perfectionist poem by poem, spoke of deconstruction as having shut out the author entirely from the poem. She commented with delight, though, that use of her poem "The Red Hat" on Advanced Placement exams shows how technology has "let the author back into the house through the window of the Internet." Students who study for the AP exam locate her e-mail (not hard; she's a professor at Rutgers Newark) and ask her in many ways, "What were you saying?" Her responses cover three areas: First, she wants readers to pay attention to the how of her poems, rather than the what. Second, she says students in particular see all poetry as autobiographical and want to ask questions about her life -- which she declines, teaching instead that poems move beyond the details of what happened today. And third, she looks with her questioners at the grounds for their assumption that questions about a poem "can best be answered by e-mail." She notes that "students' message-related efforts make an end run around the use of language in the poem." I tie this back to Hadas' recent essay in the ALSC journal, in which, clearly, the "meaning" of the poem is formed from a braid or blend of the words, any previous knowledge about the author, and the reader's own mood and experience. Here's another calendar alert: The Brattleboro Literary Festival, a great, intense, joyful weekend of authors and readers, is October 6 to 8 this year. Authors scheduled are: Madison Smartt Bell, Kai Bird and Martin Sherwin, Jaysinh Birjepatil, Robin Brickman, Bonnie Christensen, Brock Clarke, Chard deNiord, Deborah Eisenberg, Martin Espada, Mary Gaitskill, Fawaz Gerges, Ilya Kaminsky, Jamaica Kincaid, Jarrett J. Krosoczka, Maxine Kumin, Sydney Lea, Jeffrey Lent, Charles C. Mann, Alice Mattison, Bob McGee, Seth Mnookin, Mary Jo Salter, Joshua Wolf Shenk, Robert Stone, Niloufar Talibi, Brian Turner, Elizabeth Winthrop. And Kingdom Books, which is a co-sponsor, will definitely be at the readings! Look for our poetry catalogue there, too. Here's a sample of Greg Joly's new work at Bull Thistle Press. Here's my working definition of "fine press" printing": the creation of books where aesthetic experience of the object is as important as its content. Any other suggestions? CHESTER CREEK PRESS: Bob Walp was studying at Vermont College, with Sarah Bowen of Peacham, Vermont, as his advisor in the senior year. She noted his interest in bookbinding, but at the time, he declined her offer to introduce him to nearby printer/designer Dean Bornstein. He headed instead to Alabama, where he studied book arts with Steve Miller (founder of Red Ozier Press, then of Red Hydra Press at the University of Alabama). In the broader program, he discovered an interest in all the book arts, and when someone offered him his own press, he became hooked. His first production was a 12-copy edition of eight poems by Edna St. Vincent Millay that he now calls “almost respectable.” Bob now uses two tabletop platen presses and a Vandercook proof press. He did eventually meet Dean Bornstein, who kindly gave him the necessary tips to move into more finished work. He attended the Paper and Book Intensive (PBI), and also stays in touch with fellow U of A student Daniel Urban, who apprenticed with Sam Hamill at Copper Canyon Press and is now working with Tuttle Press in Rutland, Vt. Bob just finished his MA and his thesis project, a cased volume of Jody Gladding’s poems, is here, with several other items. PERPETUA PRESS: Dean Bornstein’s design work for the Stinehour Press in Lunenburg, Vt., from 1993 to 1997 led him into his own press work. A design and printing studio now occupies the small, neat barn at his Peacham, Vt., home. Some of his pieces are principally type (see the wondrous Eric Gill item); others, especially in conjunction with photographer Gregory Spaid, have led him into large-format black-and-white photo projects. Dean’s earlier background included work for Ron Gordon at Oliphant Press (NY); Ron in turn drew from experience at Joseph Blumenthal’s Spiral Press (NYC). Note that this connection too circles back to Vermont, as Blumenthal’s nephew, Chris Morrow, is the current owner of Northshire Books in Manchester, Vt.
LUCKY DOG PRESS: Lucy Swope’s luck in fine press came when she was "artist in residence" in poetry at a local high school, when she spotted a platen press seeking a new home. In 1993 she completed her first book, "The Story of I-Am-A-Dragon." Rich with wood engravings and fantasy, it's a story her son told her when he was 4 years old. (He's now 35.) Lucy's line of books features cats, dogs (lucky ones, of course! ), even horses. Early items bear the Elizabeth Farm Press imprint; her move to West Fairlee led to Lucky Dog, a folk art imprint entirely hers. BRIDGE PRESS: Brian D. Cohen learned engraving on the job as a teacher at the Putney School, and has collaborated with poet Chard deNiord in many of the broadsides and folios issued through his Westminster Station, Vt., press. The most recent offering of the press is a collaboration with his wife and is called The Bird Book; it includes 26 hand-tinted bird engravings, boards of bird’s-eye maple, and title crafted by book artist Julie Chen (Flying Fish Press). 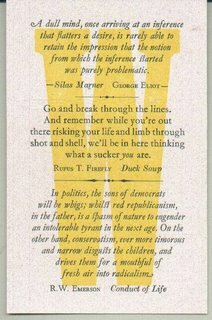 BULL THISTLE PRESS: Political, passionate, precise, and perfectly wonderful to see and hold: These are the broadsides and very limited books from Greg Joly of Jamaica, Vt. Linked artistically and politically with Bob Arnold of Longhouse Press, Ed Rayher of Swamp Press, and Gary Metras of Adastra Press, Bull Thistle began in 1990 with a 600-pound New Champion foot-treadle cast iron platen press (c. 1895). Expect surprises. We also have nice collections from Brooding Heron Press; Toothpaste Press; and of course The Stinehour Press and David R. Godine. Drop me an e-mail for directions. We'll provide a light supper so people can hang around a while! A huge Thank You to this warm, energetic couple, who drove from upstate New York to be here. What a gift to those of us who've appreciated the Westlake touch all these years. Watch for the signed Donald Westlake, Richard Stark, and Tucker Coe books we'll soon release. And yes, we have a few signed copies of An Uncommon Scold, by Abby Adams (Westlake), which will make dandy holiday gifts for both collectors and those who enjoy a good chuckle (and a bit of provocation) in terms of how different men and women can be. Hurrah! Nuyorican poet Martín Espada confirmed that he'll join us at Kingdom Books, then reading at the St. JOhnsbury Athenaeum, on Sunday October 8. It's a long drive for him from Amherst, Mass., but he's giving a reading and then taking part in a salute to Neruda at the Brattleboro Literary Festival that weekend (more details later). We'll host a Sunday brunch for him here. Monday September 18, 4 p.m., Sarah Stewart Taylor with her new book STILL AS DEATH, a satisfying Sweeney St. George sequel. Since this author's husband is campaigning for the lieutenant governor slot in Vermont, we'll offer a buffet dinner after the reading, to talk politics with him. Novel twist! Monday November 13, 4 p.m., Archer Mayor with his latest Brattleboro mystery featuring Joe Gunther: THE SECOND MOUSE. Willy Kunkle and Sammy are firmly in place again as Joe's sidekicks -- and whoa, this is new for such reserved Vermont character, there are plenty of romantic moments here, among the suspenseful ones! Finally, a quick look at the authors who are giving public evening readings at the Bread Loaf Writers Conference this month: Wed 8/16, Percival Everett and Linda Gregerson; Thurs 8/17, Sally Keith and David Shields; Fri 8/18, Barbara Klein Moss, Emily Raboteau, Kevin McIlvoy; Sat 8/19, Linda Bierds, Randall Kenan; Sunday 8/20, Ilya Kaminski, Helen Schulman; Mon 8/21, Rachel DeWoskin, Mark Doty; Tues 8/22, Ted Conover, Helen María Viramontes; Wed 8/23, Laila Lalami, Carl Phillips; Thurs 8/24, music with Francois Clemens; Fri 8/25 Thomas Sayres Ellis, Robert Boswell; Sat 8/26, David Baker, Sigrid Nunez. Readings are at 8:15 pm in the Little Theatre, are subject to change, and to confirm days and times call, until Aug 15, 802-443-5286; after Aug 16, 802-443-2700. From David Keller, at the point in the evening where one acknowledges the muse: "I'm indebted to both Bill Matthews and to a poet named Chase Twichell, whom I've never met, who showed me how you get dirty jokes into a poem -- I owe her!" And from Tony Hoagland, as he moved into reading a pair of "summer poems" that he'd brought: "When I was a younger poet I never in a million years would have considered description interesting, but I guess we get used to it. I guess I just couldn't tolerate the stillness!" Hoagland, by the way, dipped into politics, shopping malls, Musak, and love, as he addressed about 60 people in Robert Frost's barn, with the ridge of mountains darkening behind them. One of the first to step up to him after the reading, to have books signed, was fellow guest poet Kimiko Hahn; Hirshfield, who arrived just as the reading began, clearly enjoyed it too, and Wyn Cooper, Ellen Dudley, Meg Kearney, and Martha Rhodes were among the other poets I noticed in the gathering. Answer 10 Questions And The First Person To Answer All 10 Correctly Will Win An Author-Signed Mystery Book. 1. How many books are in the Richard Stark (Donald E. Westlake) Parker series that began in 1962? 2. Donald E. Westlake has used a number of pseudonyms over the years and we believe only Westlake really knows how many he has used. Can you tell us the latest pseudonym Westlake used in a 2002 book published by Carroll & Graf? 4. Donald E. Westlake wrote two books with his wife Abby Westlake that were published in 1987 by Dennis McMillan Publications. Can you tell us the two titles? 5. What was Donald E.Westlake’s first published novel? 6. What was the title of the first Donald E. Westlake (as Richard Stark) book to be made into a movie? 7. Donald E. Westlake was the winner of three Edgar Awards. What are the titles of the three award-winning books? 8. Donald E. Westlake wrote a Christmas Story for The Mysterious Bookshop in 1993 which was 11 pages and. published like a fine press chapbook. What was the title of the story? 9. In 1961 John B. Allen, AKA Donald E. Westlake, wrote a biography about an American-born actress who has been married many, many times. Who is this famous actress? 10. Donald E. Westlake will be visiting a mystery bookstore in Vermont on August 13,2006. What are the name of the bookstore and town where it is located? The person who is able to correctly answer all the questions first will receive a signed book of our choice from Kingdom Books. A quick reminder: Kingdom Books hosts a "limited edition" dinner for Grand Master of Mystery Donald Westlake and his author wife Abby Adams on August 13. We are co-hosting (at the St. Johnsbury Athenaeum) on Thursday August 17 a talk by novelist Katherine Towler (SNOW ISLAND; EVENING FERRY) that explores how she develops historical fiction. Friday August 18 is our second annual FINE PRESS APPRECIATION DAY, featuring work from Chester Creek Press, Bull Thistle Press, Bridge Press, Lucky Dog Press, Perpetua Press, and of course The Stinehour Press. 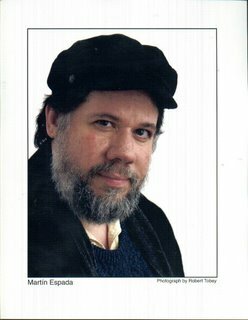 And this just confirmed: We will host Nuyorican poet Martín Espada on October 8 at 3 p.m. More details to come. Jane Shore, teaching for a second time this summer at the Advanced Placement Teachers' Institute in St. Johnsbury, gave generous recommendations to her note-taking listeners: Use Tony Hoagland's collection DONKEY GOSPEL to provide a "masculist" voice in the classroom, balancing today's feminist emphasis, she suggested. And for a wonderful refreshment, offer the student's Joe Brainard's lively little volume of poetic provocation, I REMEMBER. She also endorsed Sharon Olds as a poet whose work unlocks resistance in teens. Shore emphasized the necessary undertow of her own poems: "That's what's in it for me: that sort of tug that takes you someplace else." Galway Kinnell read from early and current work last night as the finale to the summer poetry series offered by the St. Johnsbury Athenaeum. Sweltering heat and a failing voice worked against him, yet he still drew the capacity audience into the affection and endless questioning of his work, responding to their care with two encores. STRONG IS YOUR HOLD is his new collection, with release anticipated in October. The post-9/11 volume elevates his lifelong anti-war stance, and also offers tender and delicate exploration of his love for his wife Bobbie Bristol. We recommend that readers pre-order copies of the first edition of this volume, which is sure to be in high demand.